What do commenters read and why? 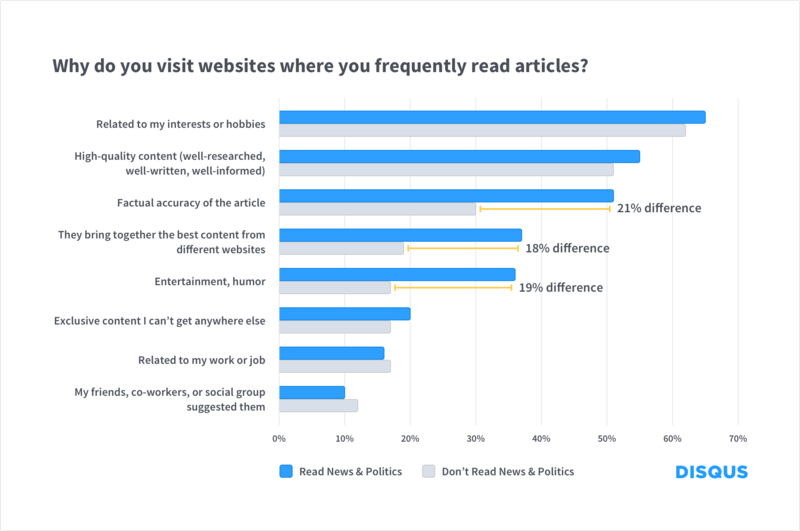 71% of respondents said they frequently read news and politics, the largest self-reported category by far. 64% of respondents frequented websites that related to their interests or hobbies. 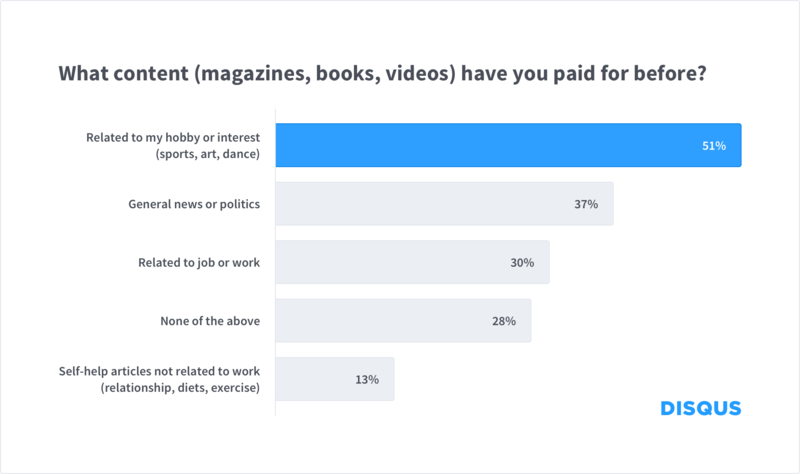 Just over half of our respondents said that they have purchased content (magazines, books, videos) related to their interests or hobbies. Our wonderful analytics team helped us comb for patterns in our survey data. We found some significant differences between two groups of people: people that self-identified as readers of News and Politics and people that did not. These results prove that there are a lot of opportunities to explore encouraging reader-publisher engagement, but maybe not quite at the level of something as intimate as a voice recording. One respondent suggested an option to “send money to support publishers and also donate to projects that solve the problems they are writing about”. 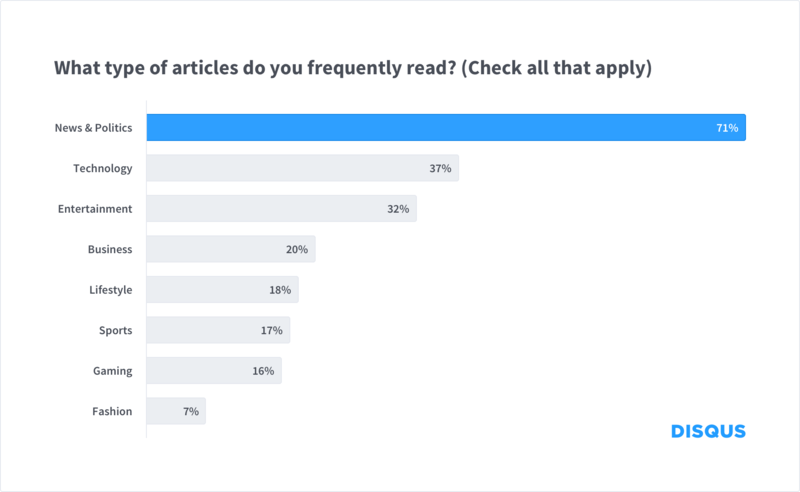 These readers are a generous group of people and their top reasons for communicating with publishers further validates the value of reader-publisher engagement. They provide a lot of relevant and useful feedback to help publishers capitalize on what their audience likes and establish a loyal following. We're a goal-oriented team that strives to have reason and logic to support any project we set out to do. We also deeply appreciate that our users were willing to take the time (about 3000 minutes, or 50 hours, collectively!) to share more about themselves with us. For these reasons, we wanted to make sure that we would be able to put that time and effort to good use. We planned this survey by creating a list of hypotheses and structured our survey questions to test them. While we weren't able to answer all of our hypotheses, brainstorming as a team allowed us to create an ongoing list of questions that we can design for future surveys and user interviews. 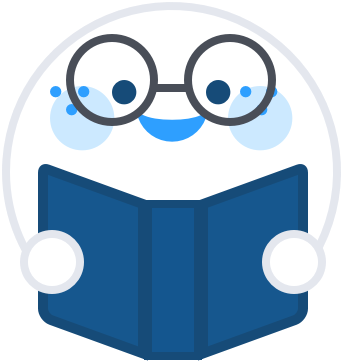 All of this information will help us impact our product roadmap to facilitate reader and publisher engagement as well as help publishers learn more about their audience. We learned a lot of interesting information and we want to continue learning more about our readers. What did you think about the survey findings? Is there anything you would like to see in future research efforts?